Everybody knows, but nobody is talking about it. Just over a month until the day finally comes, and no matter how much Tech fans like to pretend it is not happening, there is nothing that anybody can do to prevent what is coming: Ben Lammers is graduating. Yes, the 6’10” fan favorite who has been anchoring down Tech’s methodical defense, known for grinding opposing defenses and limiting high-percentage post looks is off to bigger and better things next season. Fortunately, Lammers is one of only two Tech players aging out of the program next season; fellow senior Tadric Johnson’s departure is slightly mitigated by the emergence of freshman Jose Alvarado and incoming four-star guard Michael DeVoe. DeVoe’s fellow commit Kristian Sjolund was enthusiastic in his comments to the media after signing, but it is difficult to believe that his aspirations of replacing Lammers with his spindly 180-pound frame and noted aversion to contact will work out, at least in the immediate future. With no other frontcourt prospects in the pipeline for next season, the search for a new starting center will turn inwards. Junior Abdoulaye Gueye has shone in what has unquestionably been a breakout 2017-18 season, doubling his minutes, quintupling his points and finding a reliable shot as a key contributor and starter. But as a stretch four best limited to a few reps per game at center, Gueye is not the long term solution for Tech, especially since “small ball” centers are typically more successful in the NBA than in the NCAA, where 7-footers can use raw strength and size to feast on less skilled defenders. Redshirt sophomore center Sylvester Ogbonda has regressed heavily from a freshman season where he was posting an uninspiring 1.6 points per game. This leaves but one option for the future: the freshmen. Coach Josh Pastner announced his intentions to put Ogbonda, along with freshmen Evan Cole and Moses Wright, on a redshirt program for the rest of the season before the UNC game on Jan. 20. Clearly a true redshirt experience is impossible for all three of them, as they have each appeared in numerous games this season, but Pastner said that their days would no longer be focused around preparing for games, instead lifting and doing positional drills six days a week. With Ogbonda’s future contributions to the team expected to be relatively low, who are these two freshmen tasked with filling the shoes of “The Lamminator?” Cole and Wright are both true freshmen, both 6’9”, both 210 pounds, and both have extremely limited playing time from which to draw any long-term insights. Wright started the first game of the year against UCLA, but after going 0-6 in 16 minutes with as many rebounds as he had fouls (2), he was relegated to the bench until the final games of non-conference play where he started again for four games. Despite playing over 20 minutes in a game six times and getting serious rotational minutes throughout the 16 games he appeared in, Wright has only topped the five-point mark once with a 19-point effort against a subpar Florida A&M squad. Cole has yet to start in any of the 14 games he has appeared in, and since the duo’s minutes have both been kept under five in any game they actually get in as of late, it is safe to say that there is not much gameplay to examine. What follows is an attempt to extrapolate the small amount of data available on these freshmen. Actual mileage may vary. Pretend for a moment that Cole and Wright have accumulated enough minutes for their numbers to be treated as serious bases for their careers going forward. Wright averages 10.2 points, 8.3 net rebounds and 1.4 blocks with a 43.2 two-point shooting percentage per 40 minutes, while Cole averages 8.5 points, 7.4 net rebounds and 0.7 blocks at a 58.3 two-point clip. The first thing that sticks out is the lack of blocks from both big men. Part of this can be attributed to a lack of opportunities, but the Tech’s defensive identity may need to change moving forward to a more man-zone hybrid scheme that allows for undersized frontcourt men to close on the ball sooner and use their quickness to slow opposing centers. While a year of weight training may work wonders for physicality, a 6’9” frame in the paint is never going to win on strength and length alone. Neither has a serious edge in rebounding, but in terms of points per game, Wright is a more skilled scorer simply because his 10.9 shot attempts per 40 dwarf Cole’s 7.4. That being said, this does not mean that Wright is necessarily the better shooter; with an effective field goal percentage (eFG) of 38.5, Wright is a classic example of the Monta Ellis fallacy: conflating volume with efficiency. In fact, Cole has the superior offensive rating (89.4 vs 85.9) of the two, even with a lower usage percentage. 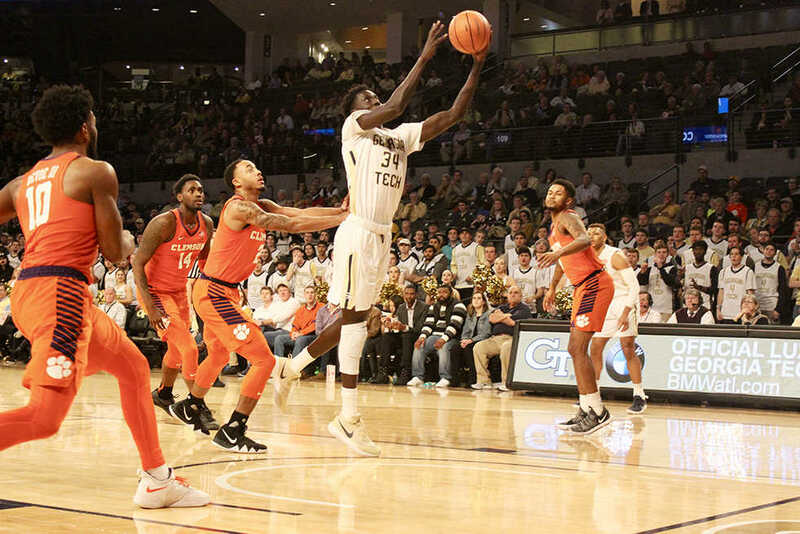 Unselfish play could prove useful next season if the Jackets take the Technique’s recent advice and cut the dreadful space-and-pace offensive scheme and operate through Alvarado with knockdown shooters Okogie and Devoe. Truth be told, it is far too soon to know what to expect from either of these players in the 2018-19 season. Aside from Cole’s pedestrian zero point/one assist/two rebound performance in the five minutes he was given in the loss to FSU, neither of the two has recorded a statistic in a meaningful game since Miami. Only time will tell which of the two will emerge on top in the race for the starting job next year. If Ogbonda somehow defies the odds and steals the starting spot away from both of them, rest assured that he will receive more than a little attention from this paper when the 2018-19 season rolls around. Replacing Lammers is a tough task, and the field of candidates has been set.